NATO’s largest wargames since 2002 will be held on Russia’s doorstep. The Trident Juncture exercise in Norway will include more than 45,000 troops from across the alliance and will combine land, air and sea elements. About 150 aircraft, more than 60 ships and 10,000 rolling or tracked vehicles are part of the exercise, NATO said. 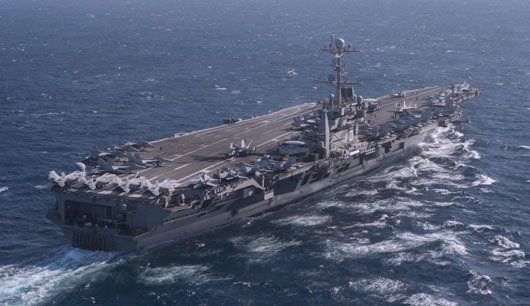 The USS Harry S. Truman aircraft carrier strike group and its 6,000 servicemembers will participate in the NATO exercise slated for Oct. 25 to Nov. 7. “Trident Juncture illustrates NATO’s relevance and unity in that we are ready to defend ourselves,” U.S. Naval Forces Europe chief Adm. James Foggo told reporters on Oct. 9 at NATO’s Brussels headquarters. Russia, which has built up its own forces near borders with NATO member nations, routinely objects to alliance exercises in Poland and the Baltic states as provocations. Foggo declined to single out Russia as the exclusive focus of Trident Juncture, saying NATO’s drills are all about defense. “This exercise has several messages – that is, NATO is capable of defending itself. It is capable of defending against any adversary, not any one adversary,” Foggo said. Lt. Gen. Rune Jakobsen, commander of the Norwegian Joint Headquarters, said most of the exercise would take place more than 600 miles away from Russia and NATO aircraft won’t be within more than 300 miles from the border. “There should not be any reason for Russia to be scared,” Jakobsen said, adding that the wargames will serve as a “stress test” of NATO’s ability to defend its territory against a sophisticated enemy. The U.S. has increased its military presence in Norway in recent years by adding a quasi-permanent force of some 300 Marines. There is a plan to increase the number of Marines in Norway to 700. Foggo told reporters at the Pentagon last week that Russia has been emphasizing its undersea capabilities. “They see that as asymmetric. They see it as one in which there is a challenge, and that challenge is the United States Navy and the United States submarine force,” Foggo said.